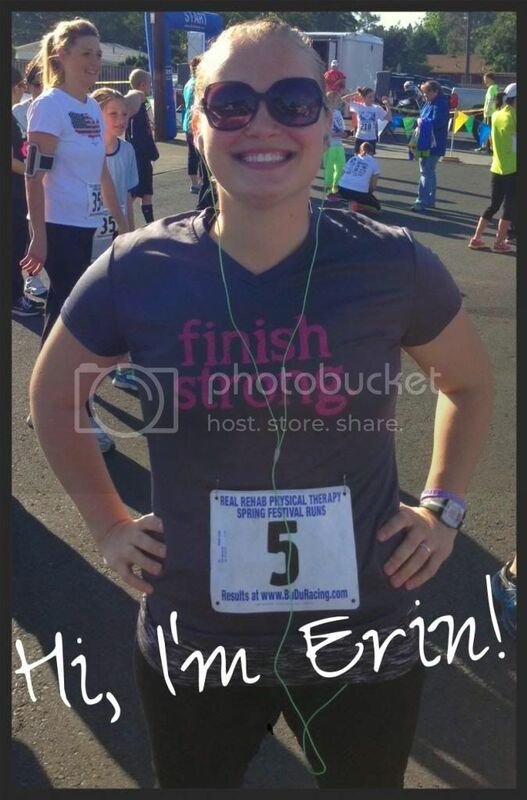 I'm Erin. I'm in my 20's, enjoying life with my hubs, Blake, and our husky, Kia. 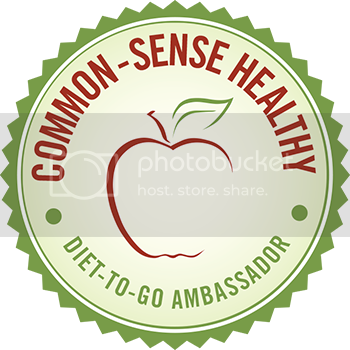 Its time for LivingMadeHealthy.com to be self-hosted and I’m pumped. Self-hosting means more control for me over my design and my content. First things first, I have to get my content transferred to my web host! The site might be down for a while, I’m not sure but I’ll be back as soon as possible! Thanks for sticking through this transition. 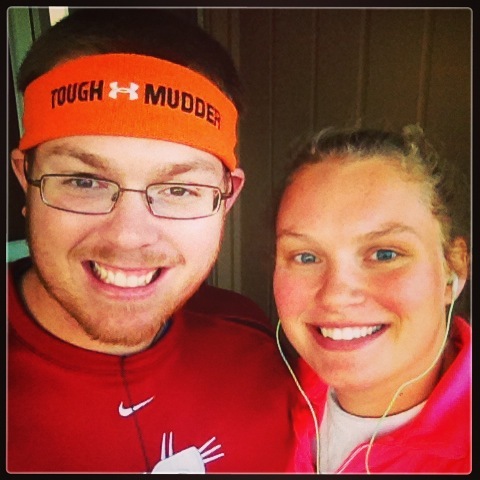 This entry was posted in healthy living on January 15, 2014 by mrsalexzan. 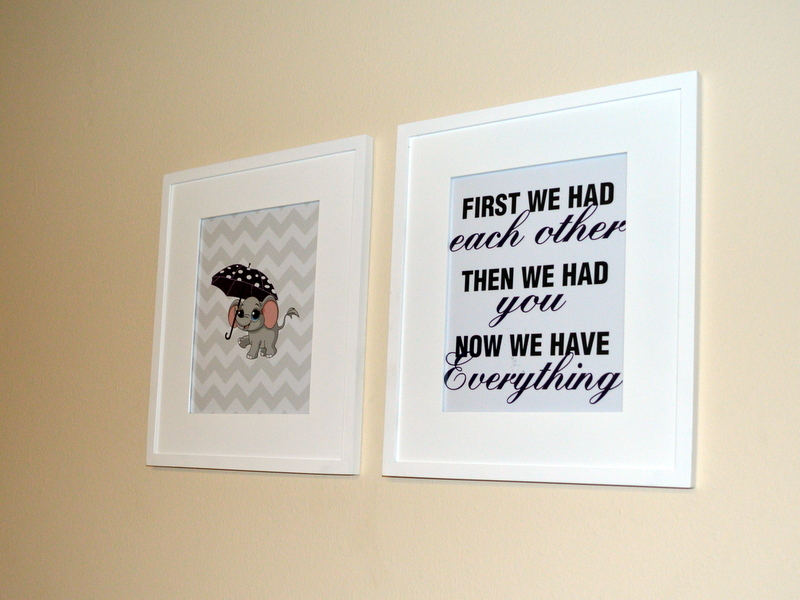 I’m really excited to share Baby Alexander’s bedroom with you today! 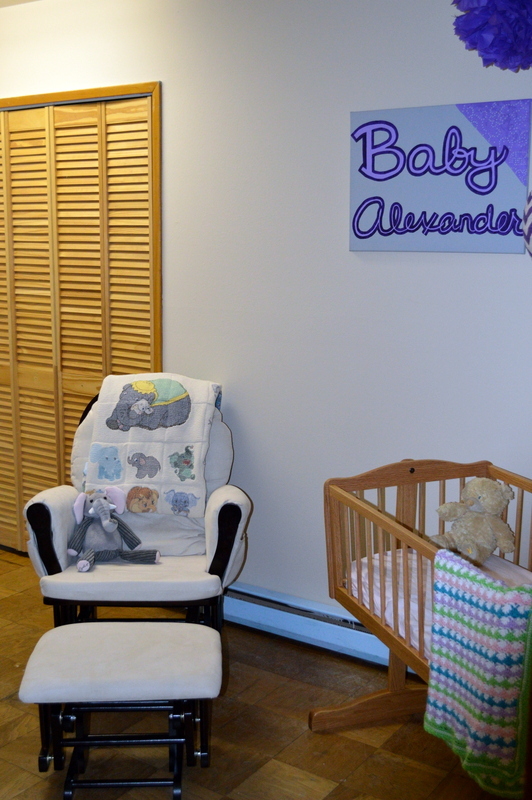 I really wanted to create a beautiful and relaxing place for Baby Alexander, it really turned out well. Each piece was selected and created with love especially for her. The theme was supposed to be grey and purple with chevron print and baby elephants. It seems like a lot, but it flowed pretty well. Of course, we were blessed with wonderful gifts of pink so there is some of that thrown in. It starts with this handmade sign for the door. That really cute “Baby Alexander” art was painted by my best friend, the one that threw my shower. 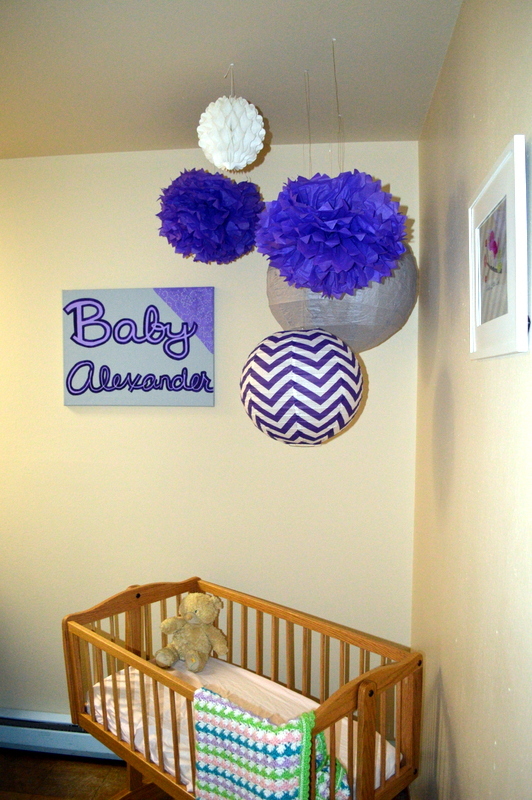 The pom poms are from the baby shower, and I ordered these lanterns online. My mom made this beautiful baby cradle! Its really gorgeous. I’m so thankful for my mom! We are waiting to get a crib until after we move into our new house in a few months. The adorable, colorful blanket was made by my mother-in-law! And it has a really cute matching jacket and hat! Right next to the cradle is my glider, and the blanket on the back of the chair was made by my mom! (This baby has some really crafty and talented grandmas) Each little elephant is hand stitched and the back is super soft elephant fleece. Scary right! I love the way it turned out. It took a lot of work, we had to scrap, sand, and re-do the edged but it was all worth it. 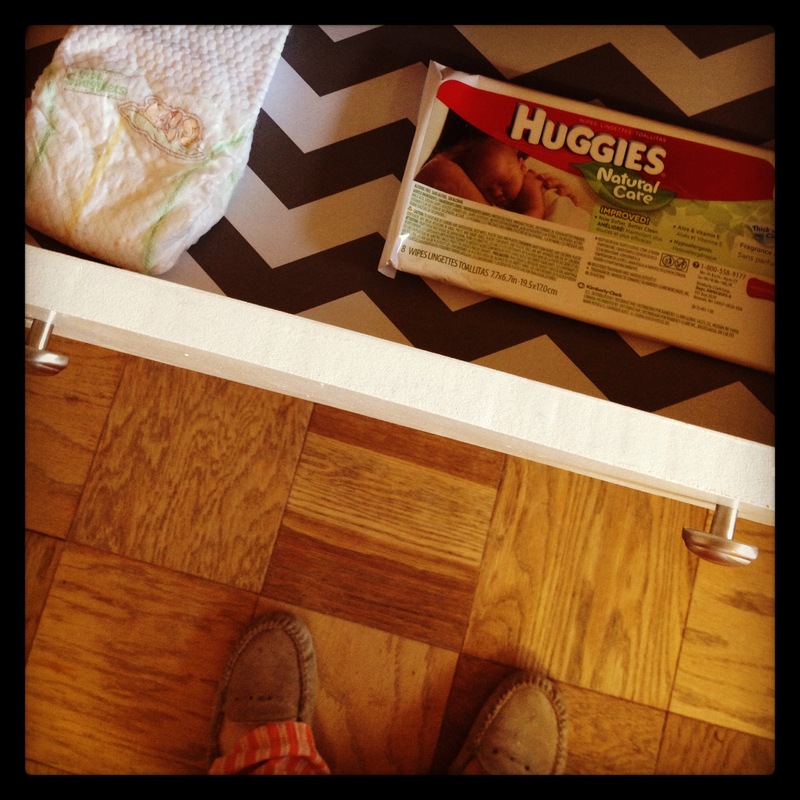 I even lined the inside of the drawers with grey chevron contact paper. I also re-did this bookshelf. The little bins are holding her bath stuff like baby shampoo, other toiletries, and towels. 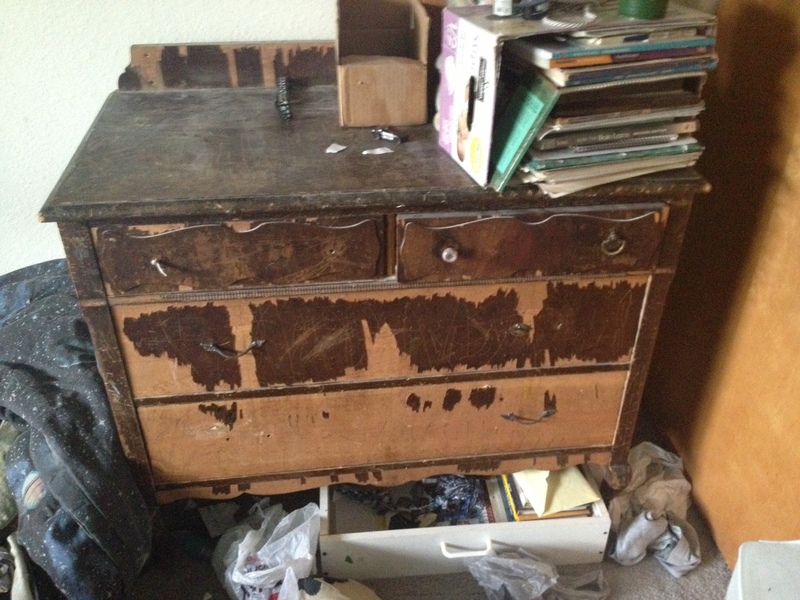 The back is also lined with same chevron paper from the dresser. 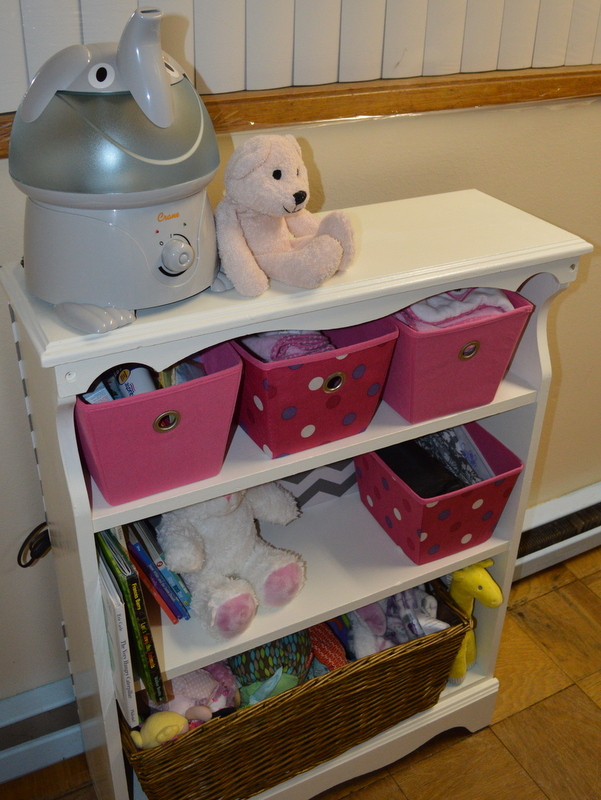 Nana Alexander picked out that adorable elephant shaped humidifier! Baby sure needs a lot more books. For artwork I created these prints and I think they turned out great. And this one is actually just a gift bag that I though was seriously adorable! I wish I could get a good picture of the whole room, but it just doesn’t work with the shape of the room. I’m so happy with how great the room looks and feels! 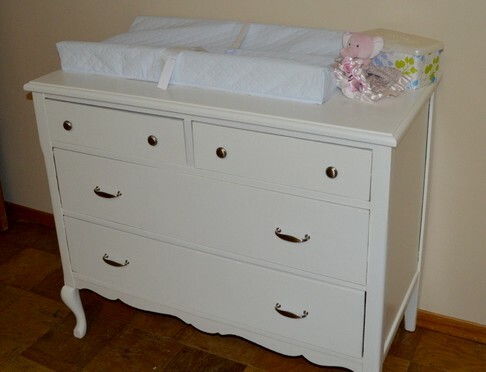 I just love how each handmade piece came together to create a wonderful baby nursery. I will admit that I cannot wait to move into our new house so I can’t paint her walls and make her room even more special. It just didn’t seem very economical or worth my time to this rental when we are about to move in just a few months. At first, I was really bummed that everything wouldn’t be “picture perfect” by the time she makes her way home, but I know that it won’t really matter in the end. She will be so completely loved by us, that’s what really matters. I do have a few more final touches, but I’m no hurry. They are more for when we are moved into the new house, I know her room will be my first priority. 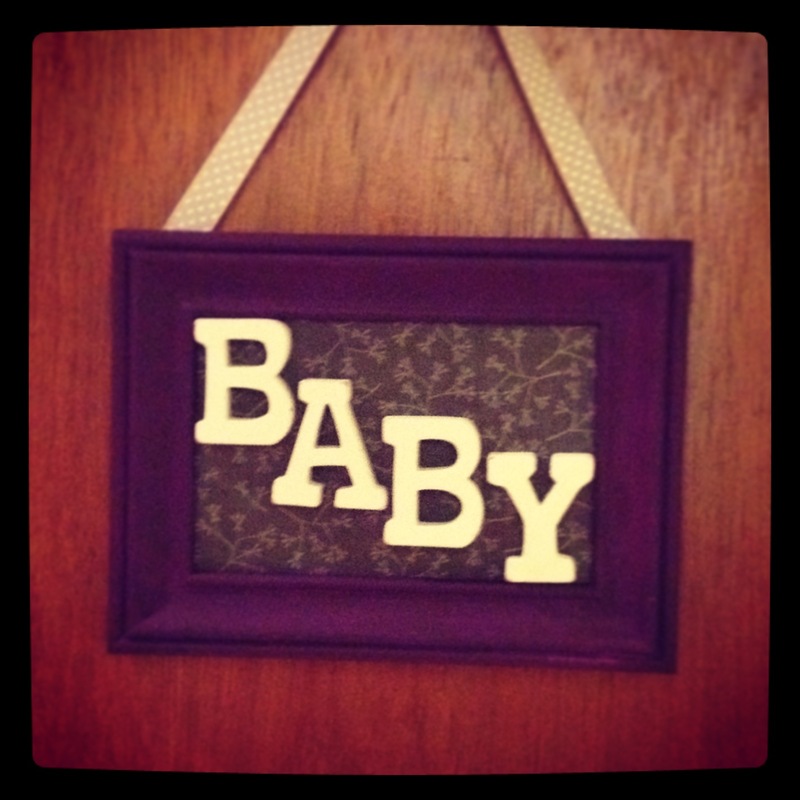 Now the room is just waiting for a baby…. 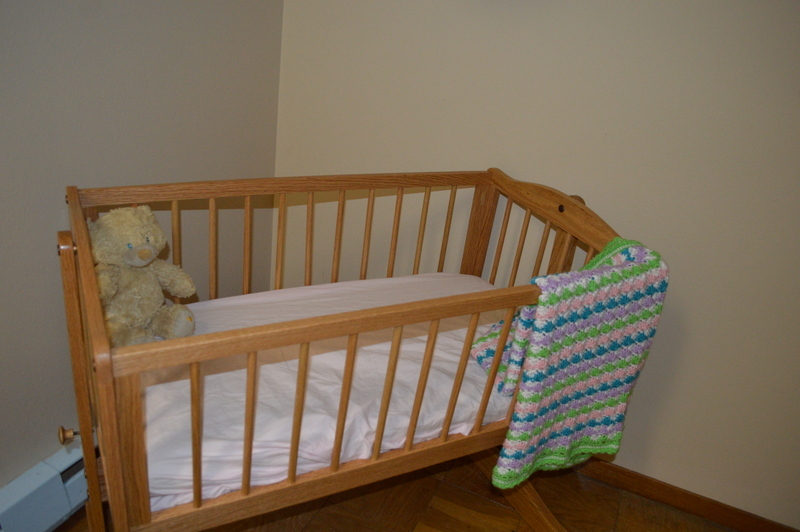 This entry was posted in family, pregnancy and tagged Baby, baby nursery, baby room, family on January 14, 2014 by mrsalexzan. I’m feeling very chatty tonight! So this will be a babbling type of post. The last couple of days have been pretty interesting. I’m experiencing some serious swelling! Its mostly in my hands and face but we were pretty active yesterday so my feet are slightly swollen and sore today. 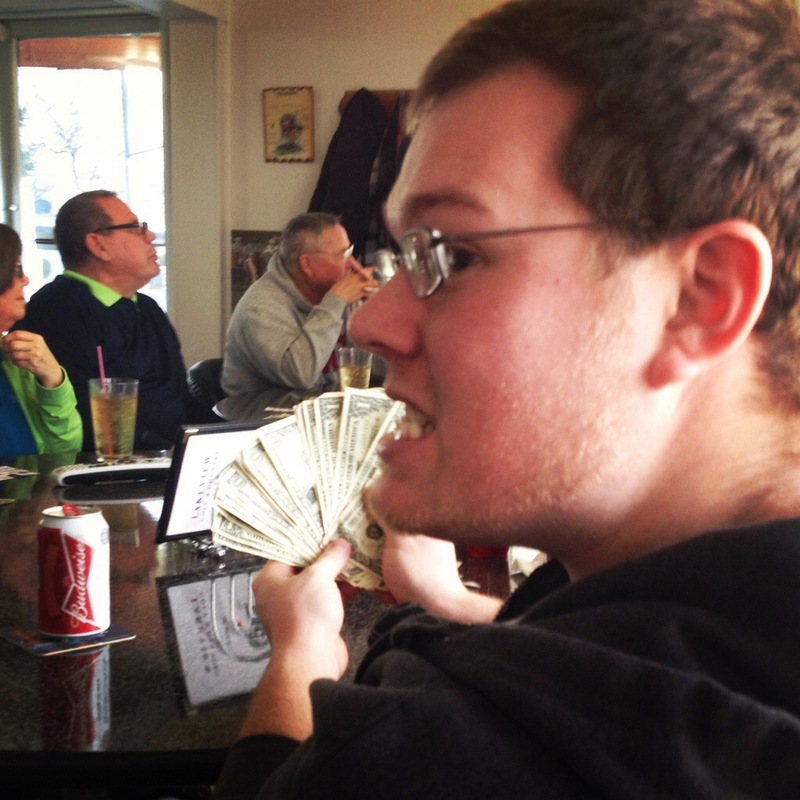 Its pretty noticeable to me in this picture from my Wordless Weekend post. It looks like a looooong cry but I didn’t. I also had to take my wedding ring off. Boo. 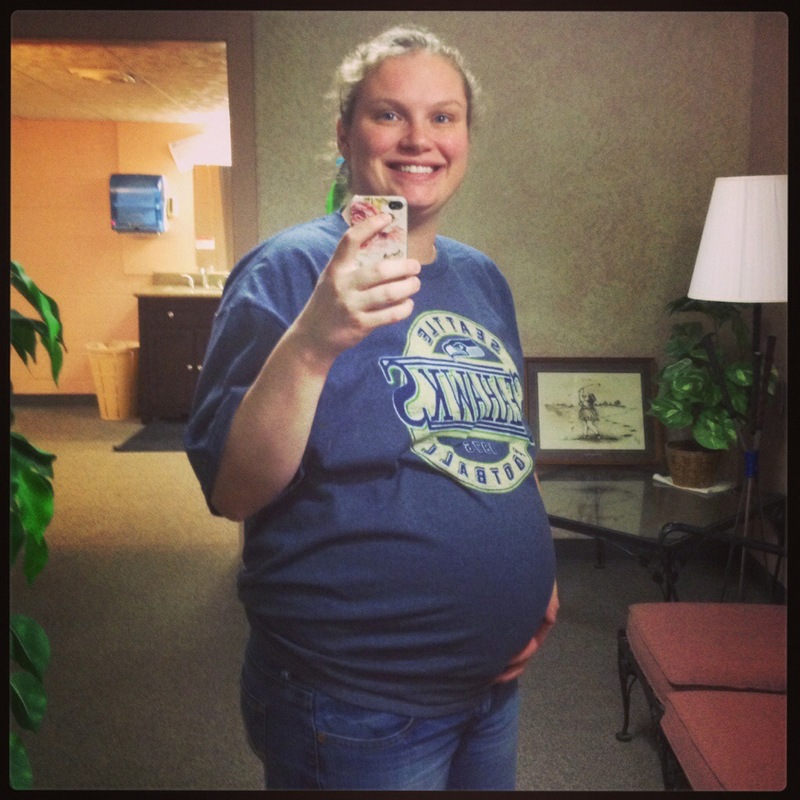 The good news….that Seahawks t-shirt is wayyyy too big! Thank Goodness! I borrowed it from my father-in-law. 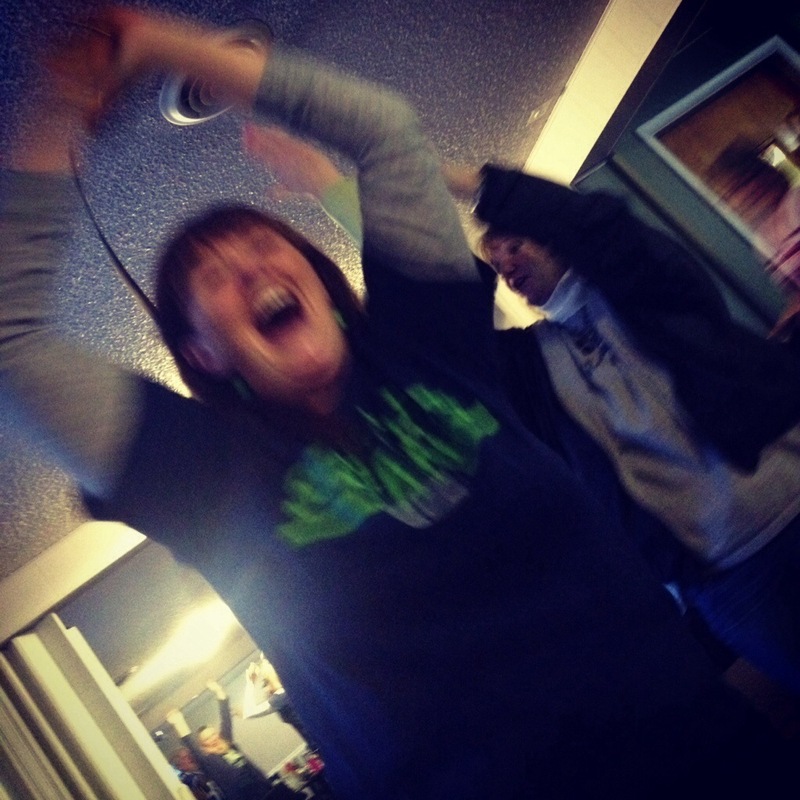 Speaking of Seahawks…The game this weekend was awesome but I’m nervous for the game next weekend. Eek. Truth be told, I have very little interest in football but my hubs loves it so I’ve watched most of the games this year. Yesterday, Blake and I took Kia for a walk and I was having some pretty uncomfortable pain. I hope its a sign that everything is moving right along and I’ll be holding my baby soon! Later in the afternoon we went to Wenatchee with our closest friends. It was so nice to get to hangout with our friends and do a little shopping. We didn’t purchase a lot of stuff but we did get a new bed spread and a Jack La Lanne juicer (just like the one I was borrowing! It was on SALE at Costco). I can’t wait to have some fresh juice again! I also picked up a few things for the baby. Letters to put her initials on the wall, felt to make something special, and a pack of bottles. I am planning to breastfeed but I will eventually need to pump when I go back to work. 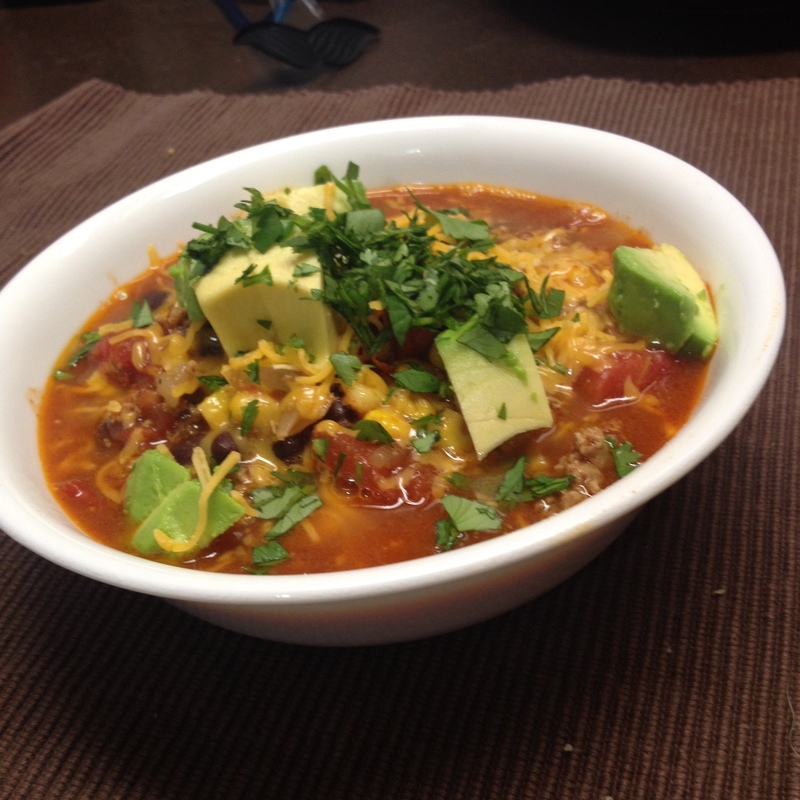 Spicy Taco Soup. Mm..mmm..mmm…delicious. This will be a repeat meal for sure. Doesn’t hurt that they say spicy food can bring on labor. Although the heartburn tonight could be killer. Maybe I shouldn’t have taken that risk. Also, I’ve been seriously hungry lately. Like seriously. I often wonder, how is it possible to be this hungry all the time? I need something to eat at least every two hours. I’ve definitely re-fallen in love with blogging over the last few weeks. Although I’m still working on switching my brain over….remembering to take photos and notes of what I’d like to write about it. It feels really good to write about whatever comes to mind. I’ve actually been thinking about “re-branding” this blog. I like writing about life and fun things I’ve been doing, and I know I’ll be writing about baby Elizabeth all time. (sorry, I’m not sorry) I wonder if that means I need to change the title of my blog? I still want to write about fitness, running, and losing the baby weight, but it probably won’t be the predominate topic around here anymore. I’m still mulling things over. Maybe a fresh headline would work. What do you think? I’d love to hear what you think. 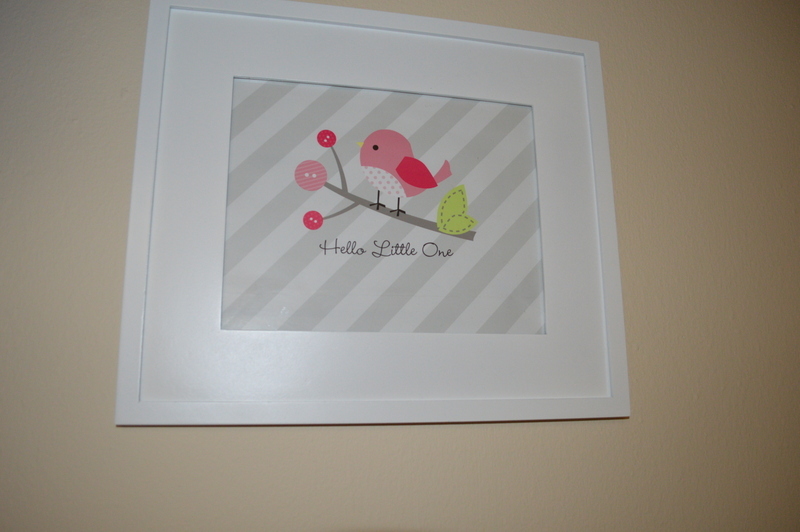 Lastly, the baby’s room is ready! Or at least as ready as its going to be while we live in this house. I’m going to work on editing the pictures so you guys can see everything. I’m super excited! I think that’s everything on my mind tonight. Thanks for stickin’ around! Good night! Hopefully the nursery post will be ready tomorrow. This entry was posted in life and tagged Baby, blogging, Eating, family, food, life, Pregnancy on January 13, 2014 by mrsalexzan. 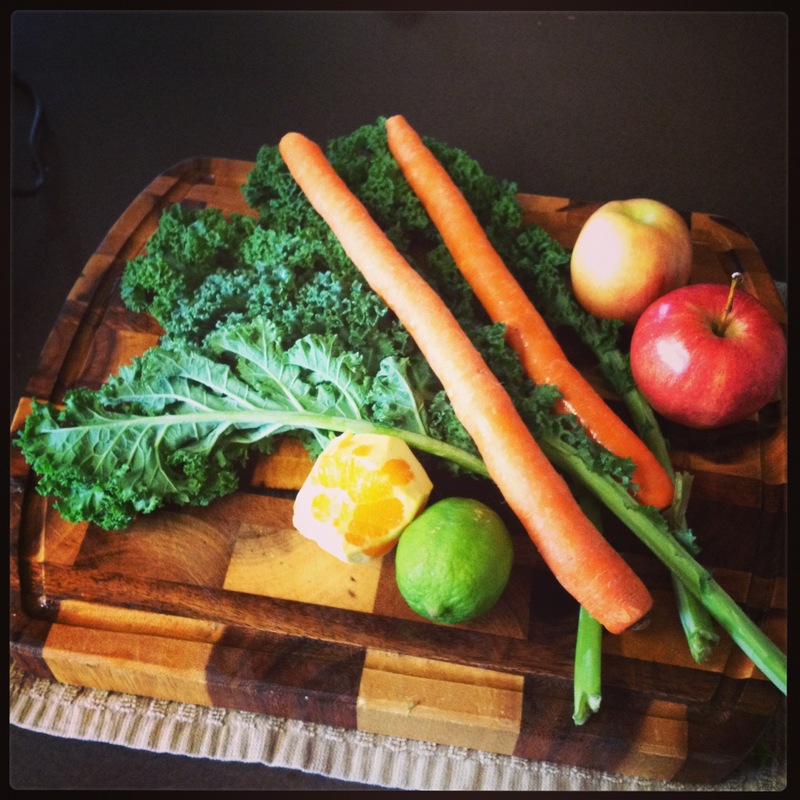 This entry was posted in healthy living on January 13, 2014 by mrsalexzan. Happy Thursday Night! I’m pretty pumped that its almost the weekend….one work day to go. 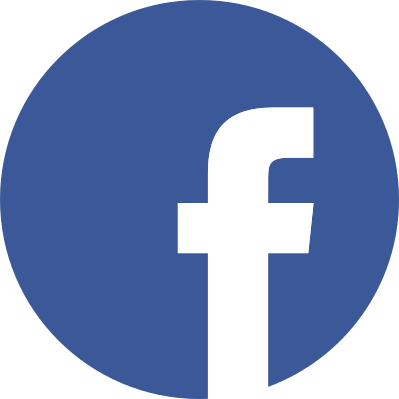 Maybe you’ve noticed that one thing has been missing around here…..workout posts. Err…..or maybe any mention of workouts. I feel like its time to confess. I haven’t completed a workout in weeks. Sadly, I can’t even remember the last time I worked out. That’s bad. You know, I had these grand intentions of having a super active pregnancy. Running all the way up until delivery, walking everyday…never having any trouble getting in a sweat session. Then I was sick….with morning sickness. Every. Single. Day. It’s hard to find the energy to run when you have used up all your energy puking. I did the best I could! I ran when I could. I even wrote this post for For Two Fitness with my Top Tips for Running During Pregnancy! Please click over & read it! I’m really proud of it. They also have super cute workout clothes for expecting mamas. By the time I felt better, good enough to run again, my body had already started to change to make room for the baby. My knees were hurting. It took me longer to catch my breath. Things jiggled…and it was painful! In October (at approximately 25 weeks), I completed the Home Sweet Home Virtual 5k held by my friend Sarah at Losing Weight & Having Fun. It was so hard! I thought I’d be able to do at least do walk/run intervals but I couldn’t. I had to walk. It was totally unexpected. It felt like I couldn’t breathe when I would run. Walking the 5k was fun, especially, since I convinced Blake to do it with me but I was still a little disappointed that running was so tough. 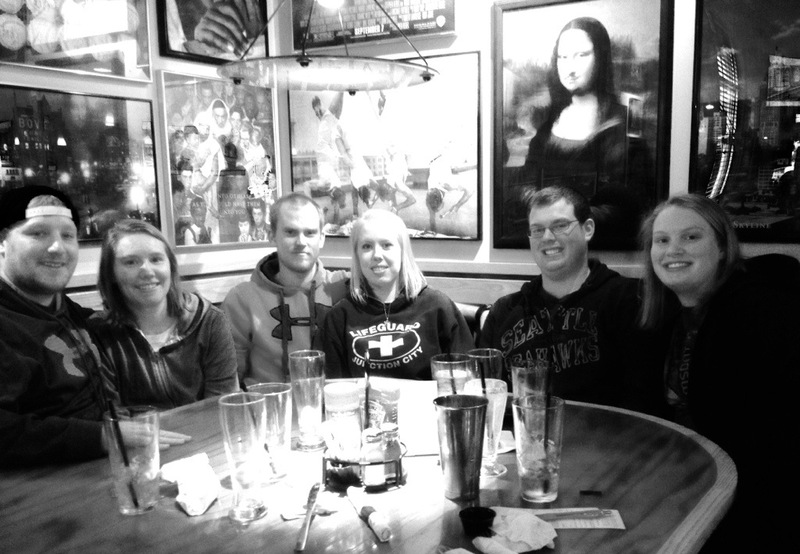 After that things went downhill….or rather just flat. Now that I think about it…that might have been my last workout. I’m a little bit shocked that its been so long! Just over two months. Yikes. Deep down I know that its just an excuse. I could have, should have, really needed to push through it but I didn’t. But I’m not going to beat myself up about it. I mean, what good would that do anyway? I am however, getting really anxious and excited to get back into the groove of things after the baby comes! I plan to bundle her up and go for walks as soon as I’m recovered. I know it will be tough to start from over from an endurance and fitness standpoint but I’m looking forward to the challenge. I don’t have a plan (yet). I’m just going to take it one day at time and see where things go. I feel extremely confident about returning to my old running and workout habits post baby. It will be a whole new experience with having to balance motherhood with work and working out, but I can do it. I’m looking forward to do it! This entry was posted in healthy living, running and tagged exercise, health, healthy living, motivation, Physical exercise, Pregnancy, pregnant, running, workout, workout clothes on January 9, 2014 by mrsalexzan. It’s been a LONG time since I’ve done a What I Ate Wednesday post, but guess what I totally remembered to take pictures of meals yesterday! Can you believe it? The truth is I’m completely burnt out on food and eating. I’ve lost all creativity. I’ve lost all desire to munch on veggies and fruits. I just feel BLAH about food. I’m bored with cooking. I’m bored with shopping. Like I said…I’m blah. So here it is…everything, and I mean everything I ate yesterday. Its not my healthiest, most creative, or most exciting day of meals but its a jumping off point…because I’m starting something totally new tomorrow. Something I’m really excited about. 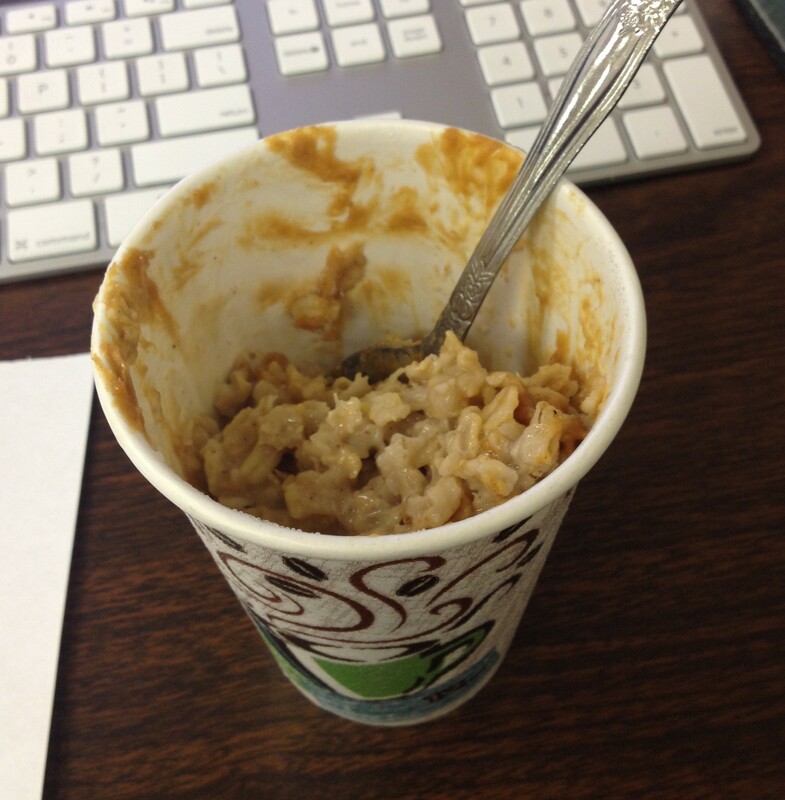 Banana & Peanut Butter Rolled Oats for breakfast at my desk. I didn’t have much of an appetite this morning so I only ate about half. I had to run to the store to pick up a birthday card during my lunch break so I saved my leftovers and bought some hot soup. 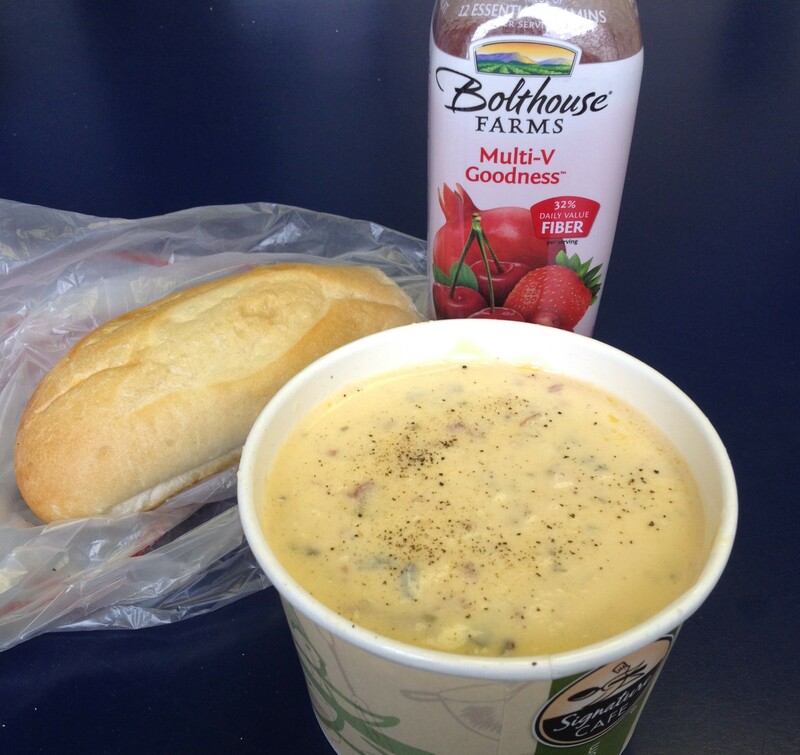 Baked potato soup with a roll and juice. Totally hit the spot. I’ll be completely honest and admit that my one pregnancy “craving” has been cinnamon swirled donuts either with maple frost or just glazed. 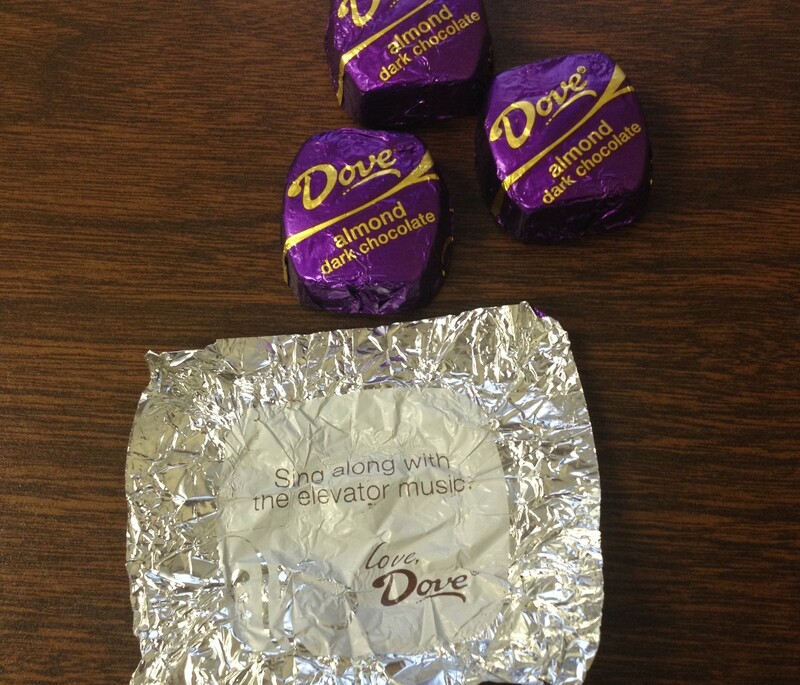 So I had one with my lunch… And I don’t even feel guilty about it. I wish I had another one right now. Later in the afternoon I snacked on few Dark Chocolate & Almond Dove squares. My dinner….well its pretty ugly but it was so delicious! Its so ugly, I almost want to delete the picture. But it was really good! A lady at work suggested this to me after I told her that I made really terrible and dry pork chops last night and I didn’ tknow what to do with them now. 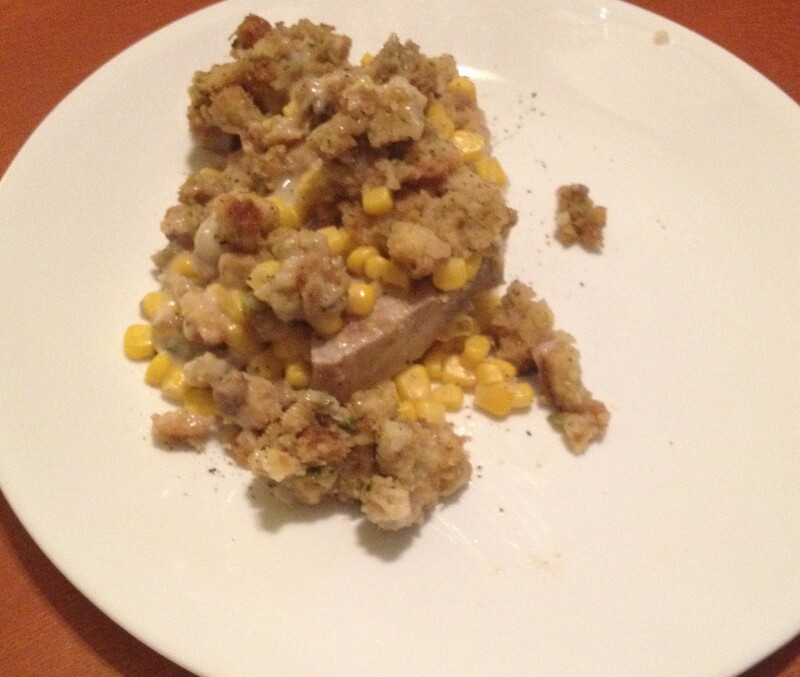 She recommended a casserole…. It starts with a can of cream of mushroom soup in the bottom of a baking dish, pork chops on top of that. Next you cover it with frozen corn but I used and canned…and lastly a box of prepared Stovetop. Bake in the oven at 350 degrees for about 30mins .Yum! I like to think of this as a Grandma type casserole! It sounded weird but was totally delish.The porkchops were no longer dry !And I finished off the night with a glass of chocolate milk. 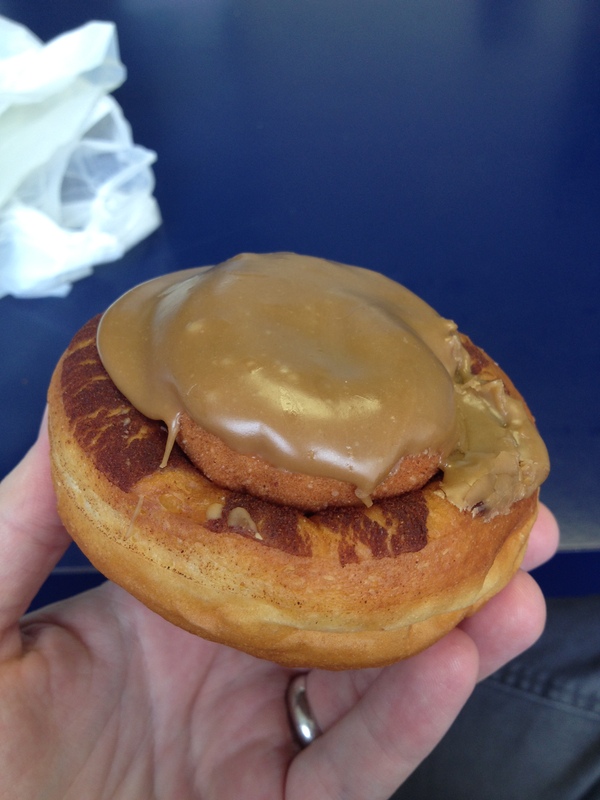 I do have to admit that knowing I was taking pictures of each meal made me stop and think a little bit….which is why I had only one donut and not two…. I know, I’m terrible…..but that baby really likes donuts. And with that….Im out here! Be sure to link up your eats over at Peas and Crayons!! This entry was posted in food, healthy living and tagged Eating, food, meals, WAIW on January 8, 2014 by mrsalexzan. Here’s hoping today goes by quicker than yesterday did! While I was thinking about my goals for 2014, I decided to make my self a to-do list for each month. Not really goals, but things I really want to accomplish each month. Some things might be a quick task like straighten up the bookshelf while others might take a few weeks or days like finishing a book. There is a lot to be done, especially since we are moving in a few months. My main objective for the month of January is to get organized but I also have some other things on my to-do list. I think that’s enough for the month. The first three are the most important! Every time I look in my hall closet I want to scream, its such a mess, but it will take a while to get it straightened up. I know that once its done, it will be so much easier to keep organized and will be sooooo much easier to move. And there are two big thing being stored in the baby’s room that do not belong, but I need to make room for them in the spare room before they can be moved. With that I’m off to start the day! Hope you have a good one! What do you need to get done this month? What kind of planner do you use? What about budgeting system? 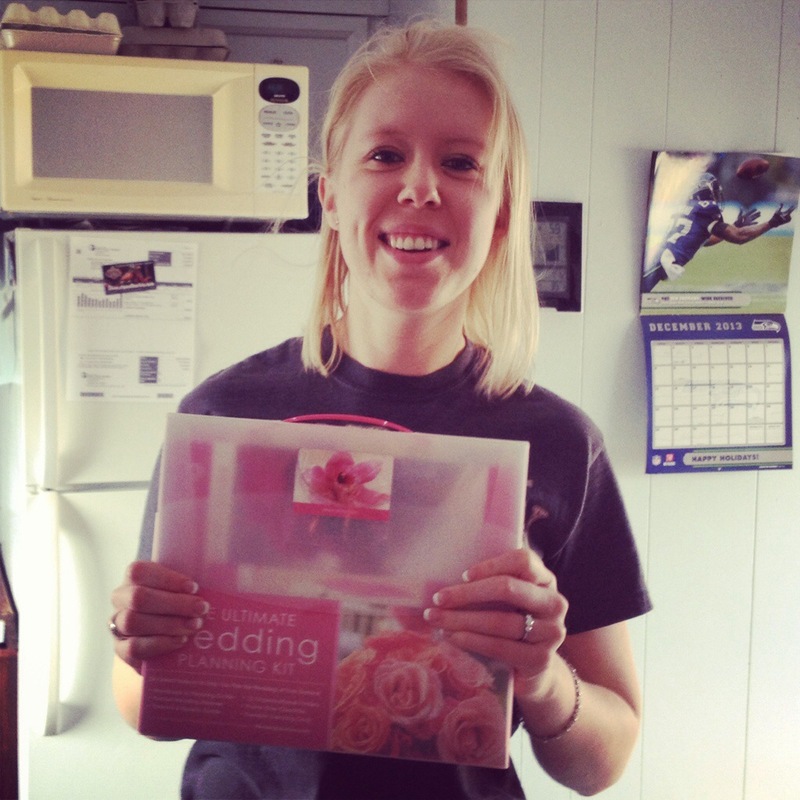 This entry was posted in life and tagged Home, housekeeping, life, organized, to-do list on January 7, 2014 by mrsalexzan.